Horses don't see the way people do. Their up-close vision is more blurry; they can't see directly in front of themselves. Their eyes are aimed more at the ground than straight in front of them. In general, anything that is hard to see can hurt them. This holds true for anything in the horse's turnout area, not just the fencing. A nail sticking out or a sharp edge can injure a horse even if it's been there a while and he's never hurt himself on it before. It is not safe to store many things in a horse's turnout area: garbage piles with sharp objects (like edges of old removed fencing or nails), stacked lawn/farm refuse (sticks and logs) for a burn pile, tractor attachments and so on all have edges on which a horse can hurt himself. Fencing and structures--anything with nails or screws--should be regularly examined. Nails or screws can work themselves loose and then stick out. Fencing must take this into account. Fencing must be easy for horses to see. For example, horses can't see thin metal hotwire; they can't even see barbed wire very well. As a general rule, fence materials must be installed to the INSIDE of the fenceposts. Otherwise it is much too easy for a horse to bump into/kick the fencing and simply push it right off the posts. This holds true for any walls or structures accessible to horses, including walls and dividers in stables. T-posts are cheap and "easy" to put in (in comparison to wood posts). However, they are not suitable for use in horse fencing. These are narrow, will not break, but will bend. 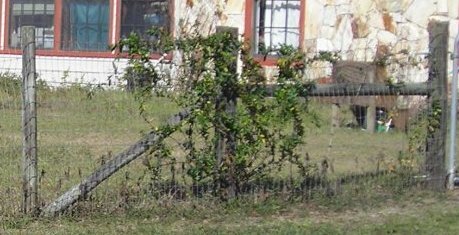 When a horse leans on a fence constructed mostly with T-posts, he may bend the posts or simply uproot them from the ground. He may bend several at once as he leans on a section of fence. The horse has just created a low ramp out of his pasture! T-posts don't stay fixed upright. If between two horse fields, if one horse bends the fence out, it is then bent inward into the next pasture. A T-post is effectively a metal spear. A horse can run into the top of the T-post and impale himself. He can also impale himself by trying to jump the fence. This is an excruciatingly painful way for a horse to be injured, and he is almost certain to die from the injury. T-posts are simply not suitable for use in horse fencing. Wood posts (round or square) have a broader surface and will not bend. If a horse runs into one, he won't impale himself on the end. In general these are the safest fenceposts. Typically 8"-10" posts are used for corners and bracing, and 3"-4" posts are used along the length of the fenceline. If a horse runs into the fence at a 3"-4" wood post, or leans against the fence, or rolls into the fence, he may break the post (particularly if they are old and very dry or rotted). Unlike T-posts, however, when a horse breaks one the others are usually left intact. They will usually keep the fence safe until you are able to replace the broken one. These are wood, and even pressure treated wood needs maintenance and sometimes replacement. However, they're a much safer choice than T-posts. Horses simply can't see thin hotwire. They can feel it if the charge is strong enough, and that may be enough to keep horses contained in most daily circumstances. However, an excited horse will run through anything, and hotwire isn't strong enough to hold a horse. 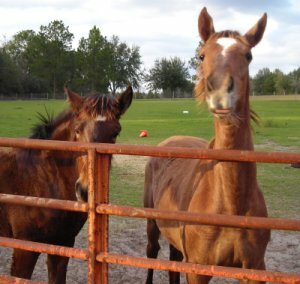 When we moved to our current farm, the horses next door were enclosed only by hotwire; they were so excited by the arrival of our horses that they ran right through it trying to meet the newcomers. It just snapped and let them right through. A new horse moving in next door is not really all that unusual. Horses can get excited over silly, inconsequential things. Weak fences are a daily risk. 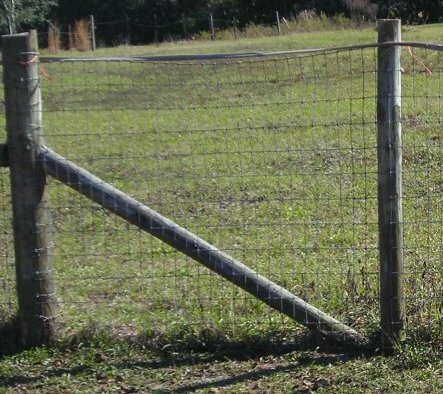 Because it is weak and hard to see, and because it has openings which can tempt a horse, hotwire is not a suitable standalone fence for horses. These white tapes and cords are much more visible than regular thin metal hotwire. They can be a great deterrent, making fences very visible and preventing horses from leaning on fences or brushing against fences. A good "hot" electric fence can keep horses away without actually causing them injury (like barbed wire gashes). Most horses will avoid electric fence once they learn where it is and what it looks like. Some will test it occasionally (or frequently). Some aren't put off by the charge much at all, no matter how "hot" it is. These do not break easily; a horse can still end up with the woven tape or cord wrapped around a leg or a head, and "saw" with it as they try to get free. If the horse is frightened by the charge of the electric fence, the panic can be all the worse. These are not suitable for use in any design that leaves enough space between them that a horse can get under or through them. Horses can't really see barbed wire either. A horse in a barbed wire fence may brush up against the fence before realizing it's there, and can scrape up his hide. The barbed wire can be especially hard to see if it is rusty. 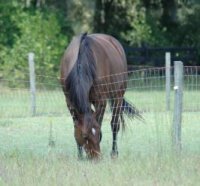 Since the horse can't see it well and doesn't know exactly where it is, he can do quite a lot of damage to himself by grazing around it--and, being horses, of course they will graze around the fence, even if they have 30 acres in the enclosure. They can scrape their faces or their eyes. They can stick their heads through the wire and do some severe damage trying to get them back out. They can stick their legs through the wire pawing or just trying to reach, and end up caught. Pictures of Fantasy's barbed wire injury. The owners told us she had done something similar when she was younger, and she has big scars on one leg to show for it. Pictures of Petra's injury. This happened just after she'd been turned back out, after stall rest due to a previous barbed wire injury. We caught them, then went over to see what had happened. We found that they had barbed wire on the far side of their property; it was attached to big 4"x6" posts. The barbed wire was in a huge tangle, dragged over 20' from the fenceline, and two of the fenceposts were uprooted. Apparently, she got her leg through the barbed wire somehow, couldn't get out, panicked and pulled, and somehow got even more tangled. She pulled up those fenceposts using wire with barbs that was wrapped around her leg! Because it's a dangerous material (sharp and barbed), because it has openings that tempt a horse, because it's not visible, barbed wire is simply not safe for horses. High tensile wire has all the problems of barbed wire except for the barbs. It can be stronger, however, and horses can get caught in it just as easily as they can in barbed wire or hotwire. Horses can saw through the soft tissues of their legs trying to free themselves from high tensile wire. Enough said. Board fencing is quite visible for horses, and usually strong enough to withstand normal everyday use. However, it also has openings large enough for a leg or sometimes a head, and horses can get stuck. If a horse runs into board fencing at high speed, it can crack. In strong weather, weakened boards can be ripped off their fences and become flying missiles with nails sticking out. Welded wire looks like a solid fence, and has openings that looks pretty small. However, welded wire is only tacked together at the meetings of the wires. It breaks very easily. When a horse runs into or even bumps into it, the wires can break free from the joint, leaving 4 wires sticking out. When a horse runs through welded wire, those loose ends dig deeply into his body, leaving lacerations down the whole length. Welded wire looks good, and is cheap, but it is weak and dangerouns once broken. Welded wire is not suitable for horses. 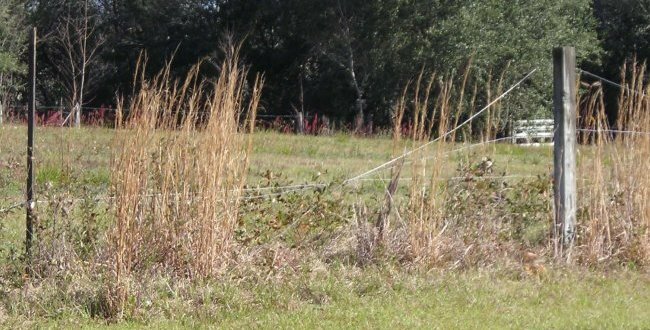 Field fencing has openings that are 4" across, and small at the bottom, getting larger towards the top. It is more visible than a single wire at intervals (like barbed wire). It is a woven wire, so will hold against casual impacts. Woven wire will rebound when a horse runs into it, rather than break. However, a horse can still get his leg through this fencing, and get caught. He can saw off the bulb of his heel trying to get free. He can also catch his shoes on it trying to get free; he can be trapped, or rip off his shoes. It's not entirely unsafe, but is not the best choice for horses. This can be made safer by using a line of hotwire across the top and bottom of the fence to keep a horse from leaning over it, or pawing at it. No-climb fencing may bend across the top if a horse leans on it. A good installation will have some form of protection across the top of the fenceline. A breakable thin metal hotwire strand with a good charger is safe to use and will keep horses from leaning on the fence. A single board is often used, but board can break and boards can be blown off the fence by high winds. A woven tape or cord electric fencing may not break if a horse gets his head under it or a leg through it. Woven wire is heavy and expensive, but it is worth the effort. It will protect your horses better than barbed wire, high tensile wire, simple hotwire or woven hotwire with no other reinforcement, and even board fencing. Fences can be made even more visible and also decorative by growing vines against them. Some vines are poisonous, so investigate before you begin. I have honeysuckle growing near the main gate to my pasture, which produces a very sweet scent when in bloom. I have wild grape growing all over, but sadly I can't convince it to transplant to my fencing. © 2007 Galadriel Billington. All rights reserved.